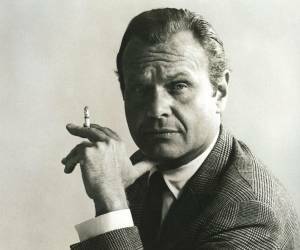 A clothing designer revered as much for his drive to dress everyday men and women as for his flare in adorning the famous, Bill Blass was a rich amalgam of homespun charm and carefully built refinement. William Ralph Blass, born in 1922 to a part-time dressmaker and a traveling hardware salesman, always knew his place was not in Fort Wayne, Indiana. Blass’s father committed suicide when his only child was 5, and Bill quickly found refuge in movies and art. Blass wrote in his 2002 autobiography, “Bare Blass.” The young Blass filled the margins of his schoolbooks with drawings of Hollywood-inspired fashions. At 15, he began selling sketches of evening gowns for $25 each to a New York manufacturer. He saved the money and at 17 he left home to attend fashion school in New York. He settled at the YMCA, and later into a West 60s apartment he shared with some friends. Blass excelled at his studies and at 18 became the first man to win Mademoiselle‘s Design for Living award. Once ensconced in New York, Blass wasted no time shedding his Midwestern persona. He took up smoking and adopted a faintly British accent. And when he found work as a sketch artist with the sportswear house of David Crystal, Blass spent most of his $30-per-week income on clothing, shoes and as many elegant meals out as he could afford. Blass, who in time became known for intense privacy and an aversion to romantic attachment, nonetheless formed strong and lasting friendships. In 1942, after good friend Ed Guild was killed in a military accident, Blass enlisted in the Army. Blass was assigned to the 603rd Camouflage Battalion with a group of 1,000 artists, writers, sound engineers, theater technicians and other creative professionals. The battalion was classified: its mission was to fool the German army, through the use of recordings, dummy tanks and other false materiel, into believing the Allies were positioned other than where they actually were. Blass’s troops drew fire, leaving other Allied troops to advance on the enemy by surprise. Blass’s outfit fought in more campaigns than any other unit in the European Theatre, quietly saving the lives of countless American soldiers. Despite privation and ever-present danger, Blass was content. His mind was never far from fashion. In idle hours, Blass filled his notebooks with sketches and drawings, incorporating into them the interlinking B logo that decades later would become world-renowned. Blass left the Army in 1945 and came back to New York, where he went to work for Anne Klein and started hitting the social circuit and getting his name into society columns. Klein fired Blass less than a year later, calling him mannered but talentless. Undaunted, Blass eventually dug himself in as an assistant designer at Anna Miller and Company, and later at renowned fashion house Maurice Rentner, and began establishing himself in women’s fashion. The hallmark of Blass designs was that they were always wearable. In the days when high fashion more resembled unreachable artwork than anything anyone would be seen in on the street, the term “wearable” was an industry epithet. But Blass didn’t care. He wanted to make clothing that women could adorn themselves with day into night. He may have designed for high-society New York debutantes and grande dames; he may have dressed movie stars and presidents’ wives, but the rest of the country’s women knew his look would flatter them, too–and they flocked to buy his pieces. Blass is credited not only with producing stunning evening attire, but also with pioneering the American casual style of fashion. His high-quality, expensive pieces were offhandedly sophisticated, as if the wearers, though lounging on a manor porch, could at any moment be off for a spontaneous cross-country road trip. Throughout the 1950s and ’60s, Blass designed wildly popular sportswear, evening wear and accessories. But it was his menswear lines of the 1960s that placed him solidly in the limelight. In 1970, Blass established Bill Blass Limited and over the next 29 years expanded his award-winning offerings to include everything from swimwear to furs, bed linens to perfumes, luggage to chocolates, sunglasses, automobiles and more. Blass traveled to Europe for work, and in between collections he traveled for fun–around the globe and to various U.S. resort destinations, nearly always with friends in tow. As his fame and his income grew, so did his charitable contributions. His $10 million gift to the New York Public Library is one of the most high-profile of his public acts of generosity; numerous other gifts he bestowed anonymously. But as worldly, social and charitable as Blass could be, he was, at heart, a fiercely private homebody. He invited small groups of friends to his home for cozy dinners, but left easy chairs and sofas out of the impeccably designed rooms so his guests would not be tempted to stay long. Especially later in his life, Blass simply preferred the company of his dogs and his books to the whirl and drama of parties. In December 1998, Blass suffered a minor stroke while at a department store event in Houston. His company had grown to a $700-million-a-year concern. But after he presented his final collection to a standing ovation in September of 1999, the designer sold Bill Blass Limited for $50 million and retired to his home in New Preston, Connecticut. The stroke was just the beginning of Blass’s health troubles. A review of photographs from Blass’s long life reveals a man seldom without a cigarette. In 2000, he was diagnosed with oral/tongue cancer, which later became throat cancer. He and his doctors fought the disease into remission, and Blass began writing his autobiography. He finished “Bare Blass” in 2002, but never lived to see it published. The oral cancer had returned, as is often this case with this particular disease, and Bill Blass died June 12 of that year in New Preston.